SKU: V12148003BAN. 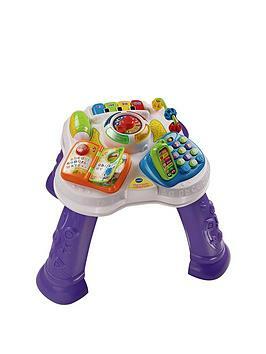 Categories: Baby and Preschool, Preschool Activity Toys, Toys. The interactive features will engage your little one and hold their interest as they have hours of fun while learning. The interactive clock helps them to understand basic time concepts, while the flip-book teaches the alphabet and animal names. The phone encourages role-play and the piano keys play music. The table includes 5 sing-a-long songs and 8 fun melodies encouraging both independent and interactive play. The table will give your baby a lot of enjoyment while you have the peace of mind of knowing they’re acquiring important skills.